An emotionally touching exploration of a life ended too short, but lived so very much. Maddie is like any other 17 year old, except she's in the Everafter; she's dead. Worse yet, she doesn't remember how she dies, and this truth keeps her from going to what awaits her beyond. All she can see are lost objects from her past, and each one brings her to a different memory in her life. Only through these memories can she figure out how she died, and who's at fault. A true mystery lies at the heart of this novel, and it's only through the well written characters will you find the truth about Maddie's death. Even at the end, I had the wrong person in mind. What I liked best about Everafter is the appreciation it gave me for the little moments in my own life. I looked back on all the little things I've lost and the memories that each object would bring. My favorite scene is when Maddie is shopping for baby clothes with her pregnant sister. She's so proud to be an Aunt, and reassures her sister that she'll be a good mother. I love this scene. It's these relationships that make a life, not whether you get a 4.0 in school. 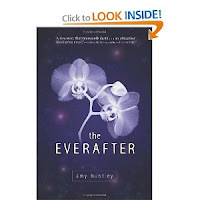 Everafter is excellently written, thought provoking, and emotionally intense. I recommend it to anyone that has trouble being truly present in the small moments of their life. Love the review. Sounds like a good book. I need to learn to enjoy moment-to-moment. Looks like a great mystery. Cover is awesome...it may not save a book but a good cover might make me want to read one more.